It’s no secret that the “City of Angels” could easily double as the “City of Foodies.” CHD Expert, the Chicago-based foodservice database and analytics firm, has recently released the latest data surrounding the restaurant landscape of Los Angeles, California. From fine dining and filets to fast casual and French fries, Los Angeles is home to restaurateurs eager to make their mark on the foodservice landscape through new culinary innovations. With more than 5,000 restaurants in the city as of May 2016, operators are constantly on the lookout for new products and services to help them compete in such a vibrant market. Suppliers and distributors with access to comprehensive foodservice data are in a good position to take advantage of numerous white space opportunities in LA. When breaking down the landscape, approximately 53 percent of restaurants in Los Angeles are considered Full Service Restaurants (FSR), and the remaining 47 percent are Limited Service Restaurants (LSR). 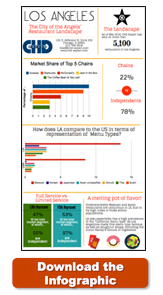 With regard to LSRs in Los Angeles, 61 percent are Quick Service, 20 percent are Fast Casual, 17 percent are LSR Beverages (Ice cream, coffee shops/tea houses, smoothie/juice), both the Delivery & take-away and Buffet segments make up 1 percent each. Want to learn more about the restaurant landscape of Los Angeles? Click here to read our latest press release in full. To access the 2016 Los Angeles Restaurant Industry Landscape Infographic in its entirety, please click below.